The fall pumpkin craze has officially begun – as I’m putting pumpkin seeds (also known as pepitas) in my kale and avocado salad tonight. I was surprised to see how much protein and fiber are in these little seeds. This filling meal only contains three ingredients – kale, avocado and pumpkin seeds and it is so delicious!! 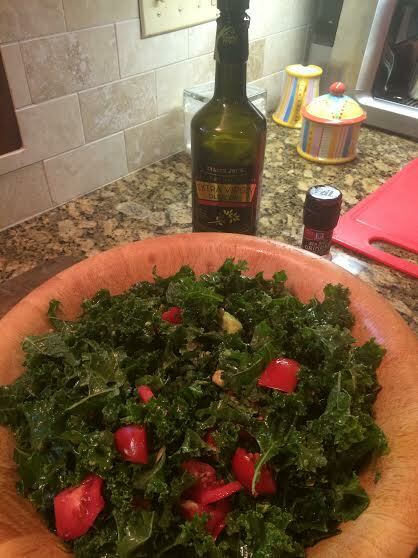 I recommend massaging the kale in some olive oil and sea salt for extra taste. We added tomatoes from the garden in the last picture. Tomatoes – if you have them! Voilà! That’s all you need for a quick dinner recipe with only three (or four) tasty ingredients.